What has been the most valuable lesson – inside or outside the classroom – you have learned at UT Health San Antonio? I would have to say the MOST valuable lesson I have learned was that everything we do is for the people who need us. Every extra second I spend studying is to recognize that one symptom other people may not see. Every volunteer opportunity is to give to those who can’t afford health care. All of the education that we can provide is promoting health in that individual as much as their families and friends. It is for global wellness. I intend to give back to the future students by becoming a mentor, a preceptor, and a teacher. I also hope to have the money to offer a scholarship like so many have done for me. It truly was an inspiration that I hope continues on into future generations. Two things, in particular, influenced my decision to pursue physical therapy. While working as a physical therapy technician, I was amazed that physical therapists positively changed the lives of their patients during simple conversation and while conducting patient rehabilitation. Additionally, I was, and still am, simply in awe of the human body’s ability to adapt to any physical stressors we put it through. The ability to use exercise to rehabilitate movement dysfunctions is absolutely fascinating. 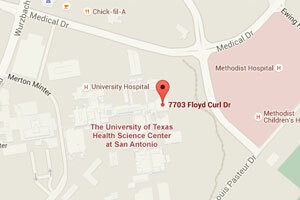 What has been your most rewarding experience at UT Health San Antonio thus far? I find it difficult to point to a singular event, as I truly believe that all three years at UT Health have been rewarding experiences. I am highly appreciative of the opportunities that the Department of Physical Therapy provided me and my class to sharpen our clinical decision making skills and treatment techniques with not only patients in the clinic, but also with students of other disciplines. The movement toward increased interdisciplinary interactions at UT Health is definitely something that I appreciate. I strongly believe that everything I’ve experienced during my time here has shaped me into the aspiring health care professional that I am today. Giving me a sense of accomplishment and understanding of who I am as a graduating doctorate of physical therapy student. Those two rewards are especially priceless to me. My interest in science and medicine began when my 2-year-old brother was diagnosed with acute myeloid leukemia during my sophomore year in high school. Through the course of his disease, I witnessed his physicians translate science into excellent patient care. He went into remission just before my high school graduation. This experience ignited my passion for medicine and revealed my craving to know more about the underlying science of cancer. How will you go forth and change the world? If I am able to continuously publish in cancer prevention research while maintaining my sense of love, loyalty and grace, I know the world will be a better place through my efforts. I also hope to impact public health and health policy with my research efforts. The field of Interventional Radiology continues to grow and add to an ever increasing list of minimally invasive procedures. I plan to contribute to this list and advance the field. I also plan to be an example to young minds seeking health care as their future. It’s easy for doctors to become tainted by all of the legalities, insurance complexities, and administrative necessities that they deal with. But, we need doctors, and we need to continue to encourage the next generation to pursue medicine. Having been the recipient of many kind acts during medical school, I feel that I have remarkable examples to look to when I think about helping future students. Although I currently don’t anticipate returning to San Antonio, Texas, I do plan to advocate and promote the Long School of Medicine. The low cost of attendance and living, the supportive Deans, the helpful attendings and staff, all make UT Health San Antonio the best medical school you could choose. I plan to direct any and all aspiring doctors to this school. I’ve also always been a fan of contributing to my alma mater, and I will continue to do so as I am able. Completing treatment for patients and seeing them genuinely happy with the end result. Rebuilding a patient's confidence and giving them the ability to smile gives me the greatest satisfaction. My plan is dual-fold: I want to give back by mentoring students as I have been mentored. I would not be where I am today without the mentors who have lifted me up throughout my entire dental school experience. I plan on giving back to UT Health with my time while the money is tight, and money when the funds are right. I do want to contribute in a way that makes sense while paying off my student loans, which mean the gifts might start off small, but I know they are still just as meaningful. Being a part of a culture of giving back is truly what makes education great and upholds the strong reputation of excellence that our school has worked so hard to obtain.